The step-by-step blueprint for success and achievement presented in these pages includes proven principles drawn from psychology, religion, philosophy, business, economics, politics, history, and metaphysics. These ideas are combined in a fast-moving, informative series of steps that will lead you to greater success than you ever imagined possible -- they can raise your self-esteem, improve personal performance, and give you complete control over every aspect of your personal and professional life. Leading futurists and prominent businesspeople are predicting that mankind is entering a Golden Age. The Western ideals of democracy, individual liberty and free enterprise are sweeping the globe and bringing prosperity, growth and human freedom wherever they are seriously tried. There has probably never been a better time for you to achieve greater success, freedom, happiness and financial independence than at this very moment. This book will show you how to improve your life, achieve your goals and realize your full potential for success and happiness. No matter who you are or what your situation, you have within you, right now, the ability to accomplish more than you ever have before. You have the potential to exceed all your previous levels of accomplishment. You can be, have and do more than perhaps you have ever imagined. All you need to do is to learn how, and then put what you learn into action. Everything in this book has been tested and proven in the crucible of real life. My own experience has made me a sort of guinea pig for these ideas. If I had designed my early life as an ideal test case, I probably couldn't have done better. I started so far behind that no one could have blamed me for not amounting to anything. I was born in Canada in 1944. My parents were good people and hard-working but we never seemed to have enough money. I still remember my parents saying over and over as I was growing up, "We can't afford it, we can't afford it, we can't afford it." No matter what it was, we couldn't afford it. They had been through the Great Depression and they had never fully recovered from the experience of worrying about money all the time. When I entered my teens, I became aware for the first time that many other families seemed to be doing far better than we were. They had nicer homes, newer clothes and better cars. They seemed not to worry as much about money as we did, and they seemed to be able to afford a lot of things that our family couldn't even dream of. It was about this time that I began asking the question, "Why is it that some people are more successful than others?" I began wondering why it was that some people seemed to earn more money, have happier relationships and families, live in more beautiful homes and generally get much more joy and satisfaction out of life than others did. As it happened, I had a lot of time to think about this question, because I spent a lot of time by myself. I was what was called a "loser." I fooled around in class. I ran around with a bad bunch of kids. I was always shooting my mouth off trying to get attention, and I eventually became very unpopular. It's said that everyone is good for something, even if it's just to set a bad example. That was me. I was the kid that parents and teachers pointed to as a warning. "If you don't straighten up,' they said, "you'll end up like Tracy." When I was sixteen, I had the first revelation that led to changing the course of my life. It dawned on me one day that if I ever wanted things to change for me, then it was up to me to change. If I didn't like being unhappy and unpopular, and in trouble all the time, then it was up to me to do something about it. This began in earnest my lifelong search for the answer to the question, "Why are some people more successful than others?" After dropping out of high school and working as a laborer for a couple of years, I finally saved a little money and went off to see the world. I have since traveled or worked in more than eighty countries on six continents. I have been in situations and had experiences that most people could not imagine. I have been dirt poor, going without food and sleeping on the ground countless times in far and foreign lands. I have also stayed in beautiful hotels and dined in fine restaurants in the great cities of the world. In time, I became a senior executive of a $265 million development company. I've met four presidents and three prime ministers. My wife and I even had dinner with the president of the United States less than six months after setting it as a goal. Over the years, mostly in retrospect, I learned a variety of lessons, and one of the most important is this: You can't hit a target you can't see. You can't accomplish wonderful things with your life if you have no idea of what they are. You must first become absolutely clear about what you want if you are serious about unlocking the extraordinary power that lies within you. Every success I've ever enjoyed came after I had taken the time to think through what my goal would look like when it was accomplished. I have since met and spoken with many men and women who have achieved great success and they all had that one trait in common. They knew exactly what they wanted. They all had a clear picture of what their ideal lives and accomplishments would look like. This vision of the kind of future they wanted to create for themselves became a powerful motivator that drove them onward. The realization of their goals seemed to flow from the exercise of establishing them in the first place. Goal setting is an important element of this system, and I'll be explaining it in detail in Chapter Five. But well before you do that, you have to do something that very few people ever do. It is absolutely essential to making this system work, and it is this: You have to decide exactly what "success" means to you. You have to decide what your life would look like if you made it into a masterpiece. Here's how you begin. Use "zero-based thinking." Imagine you could go back to the beginning in every situation in your life and start over. Like holding up a picture frame and viewing different parts of your life and relationships through it, ask this question: "If I had this decision to make today, knowing what I now know, what would I do?" Refuse to compromise on your answers. Be perfectly honest with yourself. Define your ideal in each situation before you allow yourself to get bogged down with all the reasons it isn't possible for you. All great achievement begins with your deciding what it is you really want and then dedicating yourself wholeheartedly to attaining it. Anything that you could ever want more of, or any factor that you would consider important to your happiness, can be placed in one of seven categories. These Seven Ingredients of Success are consistent with everything ever written or discovered on success and happiness. They characterize the life and accomplishments of all high-performing men and women. They include everything you could ever want. Your ideal life is a blending of these seven ingredients in exactly the combination that makes you the happiest at any particular moment. By defining your success and happiness in terms of one or more of these seven ingredients, you create a clear target to aim it. You can then measure how well you're doing. You can identify the areas where you need to make changes if you want your life to improve. You must start with your ideal, your vision of a perfect future. You begin unlocking your inner powers by lifting up your eyes and "seeing" your life exactly as if it were already perfect in every respect. Your first job is to create a blueprint, a clear picture of where you are going and what it will look like when you get there. This image will then serve as an organizing principle, a guide, a benchmark, against which you can measure and compare everything you do in the process of turning it into your reality. The first of these seven ingredients of success, and easily the most important, is peace of mind. It is the highest human good. Without it, nothing else has much value. Because of this, you strive for it all your life. You usually evaluate how well you are doing at any given time by how much inner peace you enjoy. Peace of mind is your internal gyroscope. When you are living in harmony with your highest values and your innermost convictions -- when you are perfectly balanced in life -- then you enjoy peace of mind. If, for any reason, you compromise your values, or go against your inner guidance, your peace of mind is the first thing to suffer. Peace of mind, or harmony, is essential for the optimal performance of all human groupings, from your relationships with your Mends and family members to the businesses and organizations in which you work. All interactions among people thrive on harmonious relationships. All manners, morals, etiquette and diplomacy are organized around the desire each person has to assure his or her peace of mind by not disrupting the peace of mind of others. In corporations, peace of mind can be measured in terms of the amount of harmony that exists among coworkers. Productive, profitable companies are those in which people feel good about themselves. They feel safe and happy at work. They may be busy, even frantic with activity, but they are at peace inside. The wonderful truth about peace of mind is that it is your normal, natural condition. Happiness is your birthright. It belongs to you. It is not something you experience occasionally if you're lucky. Peace of mind is central to your very existence. It is the basic precondition for enjoying everything else. Achieving inner peace must be a central organizing principle of your life. It must become the overarching goal to which all your other goals are subservient. In fact, you are only successful as a person to the degree to which you can achieve your own happiness, your own contentment, your own sense of personal well-being -- in short, your own peace of mind. The very idea of specifically aiming at the achievement of my own happiness caused me a good deal of confusion and anxiety at one time. My religious background had drummed into me the idea that my own personal happiness was not a valid consideration for my choices and behaviors. If anything, I was told that happiness was merely a by-product of living my life to make others happy. If I got any happiness, I was informed, I was just lucky. And if I didn't, then that was my lot in life. The very idea of setting happiness as a specific goal for myself was described as selfish and uncaring. A major turning point came for me when I learned two things. First, I learned that if I didn't commit to achieving my own happiness, no one else would. If my aim in life was only to make others happy, I would always be at the mercy of the feelings of others, whoever they might be. And I found that trying to organize my life around making others happy was an unending exercise in frustration and disappointment, because it just wasn't possible. Second, I discovered that I couldn't give away what I didn't have. I couldn't make someone else happy by being miserable myself. As Abraham Lincoln once said, "You can't help the poor by becoming one of them." I found that I couldn't make others happy unless I could make myself happy first. Peace of mind is so important to everything else you accomplish that it must be subjected to rigorous analysis. Where does it come from? Under what conditions does it exist for you? How can you get more of it? In the simplest terms, you experience happiness and peace of mind whenever you are completely free from the destructive emotions of fear, anger, doubt, guilt, resentment and worry. In the absence of negative emotions, you enjoy peace of mind naturally, effortlessly. The key to happiness then is to systematically eliminate, or at least minimize, the parts of your life that cause you negativity or stress of any kind. This idea bowled me over when I first came across it many years ago. Imagine! The way to live a happy, productive life is to achieve your own peace of mind by systematically eliminating the negative people, situations and emotions that make you unhappy. Wow! Could happiness in life be that simple? And herein lies the rub. The major obstacle to eliminating the negativity that interferes with your happiness is your attachment to the negative people and situations that cause it. Your rational mind comes up with all kinds of clever reasons why you must continue in your existing situation. Instead of working for you, instead of providing you with solutions to your problems, your amazing brain works frantically to keep you mired in them. Later in this book, I'll show you a variety of ways to control, and eventually eliminate, your negative emotions. I'll show you powerful techniques you can use to neutralize anger and worry in moments. I'll show you how to take complete control of your emotions and how to keep them positive most of the time. For the moment, though, your job is to engage in what is called "mountaintop thinking." Project forward in thought and imagine your ideal life. What combination of ingredients would have to exist for you to be perfectly happy? Don't worry about what's possible or not possible for you at the moment. Free your mind from all limitations and be perfectly selfish. Just define your life exactly as it would have to be for you to enjoy the peace of mind you desire. What would you be doing? Where would you be living? Who would be there with you? How would you spend your time, day in and day out? Remember, you can't hit a target you can't see. But if you can envision it clearly, there's a very good likelihood that you can achieve it! If you're in business, create this ideal future vision of what your job or work would look like if it was absolutely excellent in every respect. What would you do more of (or less of) to achieve higher levels of harmony and cooperation in your work environment? In your family, what would your life look like if you and the people you care about were living in a state of complete peace and contentment? What sort of things would you do to help others to be happy in the process of achieving your own happiness? When you set peace of mind as your goal and plan everything you do in terms of whether it helps or hinders your attainment of that goal, you'll probably never make another mistake. You'll do and say the right things. You'll find yourself operating from a higher set of principles. You'll feel wonderful about yourself. Peace of mind is the key. The second ingredient of success is health and energy. Just as peace of mind is your normal and natural mental state, health and energy is your normal and natural physical state. Your body has a natural bias toward health. It produces energy easily and in abundance in the absence of mental or physical interference. And radiant health exists in the absence of any pain, illness or disease. Wonderfully enough, your body is constructed in such a way that if you just stop doing certain things to it, it often recovers and becomes healthy and energetic all by itself. If you achieve all kinds of things in the material world, but you lose your health or your peace of mind, you get little or no pleasure from your other accomplishments. Imagine yourself enjoying perfect health. Think of how you would be if you were your ideal image of physical fitness. How would you look? How would you feel? How much would you weigh? What sort of foods would you eat and what kind of exercises would you do? What would you be doing more of, and less of? A businessman in one of my seminars came up to me after he had thought about this "ideal image" and told me that, if he was in perfect health, he would be able to run a marathon. His problem was that he was forty years old, twenty pounds overweight, and not particularly fit. He doubted that it was possible for him, but the thought process had begun. The more he thought about himself as he could be, rather than as he was, the more excited he became about the very idea of training for a marathon. He began to see himself as lean and fit. He became more and more convinced that he could do it. He bought a couple of books on jogging and started running a little each day. He got the right clothes and the right running shoes. He increased his distance each week and soon began doing "fun tams" and mini-marathons. Within one year, he ran his first marathon, 26.4 miles. He fulfilled his vision and became the person he had imagined he could be. Most important, he felt fitter, thinner, stronger and more energetic than he had felt for many years. The third ingredient of success is loving relationships. These are relationships with the people you love and care about, and the people who love and care about you. They are the real measure of how well you are doing as a human being. Most of your happiness and unhappiness in life comes from your relationships with others, and it is your relationships with others that make you truly human. A key quality of the fully functioning person is that he or she has the ability to enter into and maintain long-term friendships and intimate relationships with other people. The very essence of your personality is demonstrated in the way you get along with others, and the way they get along with you. At almost any time, you can measure how well you are doing in your relationships by one simple test: laughter. How much two people, or a family, laugh together is the surest single measure of how well things are going. When a relationship is truly happy, people laugh a lot when they're together. And when a relationship turns sour, the very first thing that goes is the laughter. This is true for companies as well. High-performance, high-profit organizations are those in which people laugh and joke together. They enjoy one another and their work. They function smoothly and happily as teams. They are more optimistic, more open to new ideas, more creative and more flexible. I used to think that people were an important part of any business. Then I learned a great truth; people are the business. The furniture and fixtures can be replaced. The products, services and customers will change over time. But if you have the right people, the company will continue to prosper. The most important single responsibility of the executive is to ensure harmony and happiness among the people he or she is responsible for, to create a climate of optimism, enthusiasm and high morale. This "esprit de corps" is the distinguishing quality of all world class organizations. What is your ideal relationship? Who would it be with and what would it look like? If you could design your important relationships in every detail, what would you want more of, or less of? What could you do, starting today, to create these conditions in your own life? Without a clear idea of what you really want in a relationship with another person, you will probably find yourself in situations not of your own choosing. Problems in life are almost invariably "people problems." They come with hair on top, and talk back. People problems do more to disrupt your peace of mind and undermine your health than perhaps any other factor. One of your chief aims in life must therefore be to create a human environment in which you can be happy, contented and fulfilled. You must examine your relationships, one by one, and develop a plan to make each of them enjoyable and satisfying. Only when you have your relationships under control and functioning harmoniously can you turn your thoughts toward the self-expression and self-actualization that enable you to fulfill your true potential. The fourth ingredient of success is financial freedom. To be financially free means that you have enough money so that you don't worry about it continually, as most people do. It is not money that lies at the root of all evil; it is lack of money. Achieving your own financial freedom is one of the most important goals and responsibilities of your life. It is far too important to be left to chance. Fully 80 percent of the population are preoccupied with money problems. They think about and worry about money when they wake up in the morning, while they're having breakfast, and throughout the day. They talk and think about it during the evening. This is not a happy, healthy way to live. This is not conducive to being the best you can be. Money is important. While I put it as number four on the list of ingredients of success, it is an essential factor in the achievement of the first three. Most worry, stress, anxiety and lost peace of mind are caused by money worries. Many health problems are caused by stress and worry about money. Many problems in relationships are caused by money worries, and one of the main causes for divorce is arguments over money. You therefore owe it to yourself to develop your talents and abilities to the point where you know that you can earn enough money so that you don't have to worry about it. A feeling of freedom is essential to the achievement of any other important goal, and you cannot be free until and unless you have enough money so that you are no longer preoccupied with it. One of your main aims in life must be to provide for your own financial independence, without self-delusion, procrastination or trusting to luck. Imagine that you had a magic wand and you could wave it to design your financial life in any way you wanted. What would your life look like if you achieved all your financial goals? What difference would it make in your day-to-day activities? What would you be doing more of, or less of? How much would you like to be earning one year, five years, ten years from today? What kind of lifestyle would you like to be enjoying? How much would you like to have in the bank? How much would you like to be worth when you retire? These are very important questions! Most people never ask and answer them in their entire lives. But if you can be perfectly clear about where you want to go financially, you can learn what you need to know and do to get there. Many graduates of my seminars have gone out and changed their lives from rags to riches. They have become presidents of large corporations. Some have become millionaires. They have started and built their own successful businesses, or been promoted rapidly in their companies or industries, but only after they decided what they wanted. When you decide exactly what you want your financial picture to look like, you will be able to use this system to achieve your goals faster than you might have imagined possible. It all starts with your defining your financial future clearly and then making a plan to realize it. Everything will follow from that, as you'll learn later in this book. The fifth ingredient of success is worthy goals and ideals. Perhaps your deepest subconscious drive, according to Dr. Viktor E. Frankl, author of Man's Search for Meaning, is the need for meaning and purpose in life. To be truly happy, you need a clear sense of direction. You need a commitment to something bigger and more important than yourself. You need to feel that your life stands for something, that you are somehow making a valuable contribution to your world. Happiness has been defined as "the progressive realization of a worthy ideal." You can only be happy when you are working step by step toward something that is really important to you. Think about what sort of activities and accomplishments you most enjoy. What were you doing in the past when you were the happiest? What sort of activities give you your greatest sense of meaning and purpose in life? The sixth ingredient of success is self-knowledge and self-awareness. Throughout all of history, self-knowledge has gone hand in hand with inner happiness and outer achievement. The phrase "Man, know thyself" goes all the way back to ancient Greece. To perform at your best, you need to know who you are and why you think and feel the way you do. You need to understand the forces and influences that have shaped your character from earliest childhood. You need to know why you react and respond the way you do to the people and situations around you. It is only when you understand and accept yourself that you can begin moving forward in the other areas of your life. The seventh ingredient of success is a sense of personal fulfillment. This is a feeling that you are becoming everything that you are capable of becoming. It is the sure knowledge that you are moving toward the realization of your full potential as a human being. Psychologist Abraham Maslow called this "self-actualization." He said it was the primary characteristic of the healthiest, happiest and most successful men and women in our society. A major benefit of this book is that it will show you how to be your own psychologist. You will learn how to achieve and maintain a positive, optimistic and cheerful mental attitude under almost all circumstances. You will learn how to develop a fully integrated, fully functioning, fully mature personality. Defining the seven ingredients of success gives you a series of targets to aim at. When you define your life in ideal terms, when you have the courage to decide exactly what you want, you begin the process of unlocking your hidden powers to succeed. In the chapters ahead, you will learn a proven system of thought and action you can use to achieve whatever goals you can set for yourself. But knowing where you want to end up is the first and most important step. In Chapter Two you learn the Seven Laws of Mental Mastery and how to use them to create whatever life you can imagine for yourself. In Chapter Three, you learn about your Master Program and how it controls every aspect of your thoughts and feelings about yourself. You learn how to reprogram it, to bring it into alignment with what you really want in your life. 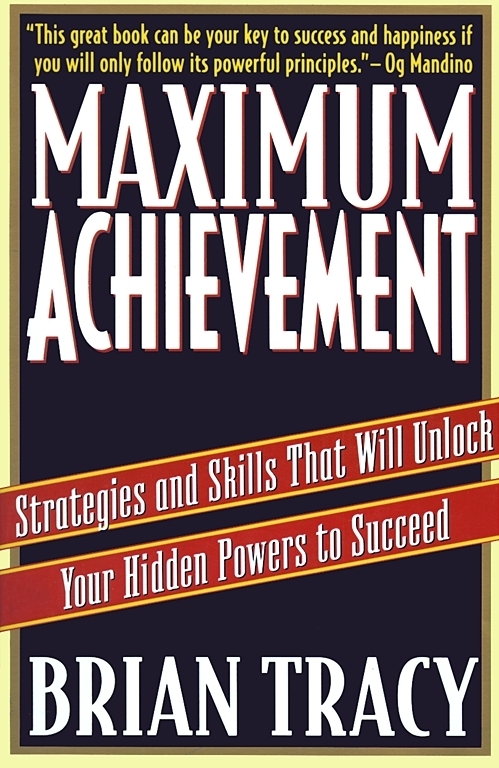 In Chapter Four, you learn about your Master Mind and how to harness your mental powers for maximum achievement. You learn methods and techniques practiced by the most successful men and women of our age to achieve their goals. In Chapter Five, you learn the Master Skill of success. You learn perhaps the most powerful process of goal-setting and goal-achieving ever organized and presented in one place. This Master Skill will enable you to accomplish more in the next one or two years than many people accomplish in a lifetime. In Chapter Six, you learn about the Master Power, the Superconscious Mind that is always available to you. Proper use of this mind enables you to accomplish virtually any goal you can set for yourself. The discovery and application of the superconscious faculty underlies all great success in the human experience, and you will learn to use it as naturally as breathing in and breathing out. In Chapter Seven, you learn the Master Decision you must make before you can activate your higher powers for personal and business success. You learn the critical difference between high achievers and low achievers. You learn how to take complete control over every aspect of your experience and how to make your life into something truly wonderful. In Chapter Eight, you learn about the Master Goal, inner peace, and how to organize every aspect of your life to assure the greatest happiness for yourself and the people around you. You learn the root causes of stress and negativity, and how to eliminate them from your life. You learn how to be more positive and optimistic in everything you do. In Chapter Nine, you begin drawing together everything you've learned in previous chapters into a focus on achieving greater effectiveness with the people in your life. In Mattering Human Relationships, you learn the foundation principles of interpersonal psychology and how to get along better with others in almost any situation. In Chapter Ten, Mastering Personal Relationships, you learn how to be happier in your romantic relationships. You learn why relationships succeed and why they fail. You learn a series of simple things you can do, or stop doing, that can transform your relationships overnight, and sometimes even faster. In Chapter Eleven, Mastering the Art of Parenting, you learn how to be an excellent parent. You learn how to interact with your children, at any age, in such a way that they grow up happy, healthy and self-confident. You learn how to neutralize mistakes of the past and build loving relationships that endure for the rest of your life. Finally, in Chapter Twelve, Mastery: The Power of Love, you learn the "secret of the ages," the most powerful force in the universe, the shaper of character and destiny, and the one thing that really matters. You learn the key to becoming fully human, to fulfilling your potential. You learn how to incorporate the principles of love into everything you do and into everything you are. When you begin to practice what you learn in this book, you'll enjoy greater peace of mind, better health and energy, more and better loving relationships, greater financial freedom, exciting goals and ideals to which you can commit yourself, enhanced self-knowledge and self-awareness, and a wonderful feeling of personal fulfillment and personal achievement. The ideas, insights and practical guidance contained in the pages ahead will bring you greater health, happiness and prosperity than you have ever experienced. As you apply these principles to your life, you will see improvements in yourself, your situation and the people around you that will appear amazing. Your whole life will open up and expand toward the horizon of your possibilities as you move onto the high road of Maximum Achievement. This system is intensely practical. Each chapter contains exercises for you to do. They are designed to empower you with the tools you need to take complete control of your life, and for these tools to work, you must practice with them. You must discipline yourself to do the exercises in sequence so you receive the full benefit of their cumulative effect. Your first exercise has been described throughout this chapter. It is for you to take the brush of your imagination and begin painting a masterpiece on the canvas of your life. It is for you to decide clearly what would make you the happiest in everything you are doing. Decide what's right for you before you decide what's possible. Create your ideal life in every detail. Don't be concerned about the process of getting from where you are to where you want to go. For now, just focus on creating a vision of your perfect future. In the chapters ahead, you will learn how to turn your visions into your realities. Og Mandino This great book can be your key to success and happiness if you will only follow its powerful principles. Harvey Mackay Looking for a book with the power to jump-start your life? Look no further. Brian Tracy's Maximum Achievement is a wake-up call to the wonders within us all. It is straight to the point and straight to the heart. Denis Waitley Brian Tracy is a master of self-management skills development. In this treasure chest, he gives us an encyclopedia of inner wealth more knowledge-based, action-oriented, and relevant to today's global achiever than any other source you can tap. More than a self-help book, this is an owner's manual for high-performance winners.